The earliest posters for the film industry were issued in a wide variety of sizes and were focused on the different types of equipment that was used. Following that the focus turned to the production company. Finally around 1910, posters started stablizing in size and became focused on the film itself. 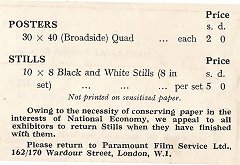 The initial sizes issued were dictated by the paper industry (see Poster Development in the UK) and the Quad was one of the first sizes issued. The British Quad measures 30x40 and was originally called the Quad Crown. This is a term that was given by the paper industry which is 4 times the size of a Crown (which measures 15x20). The original quads for issued in a vertical format by the major production companies. Shown on the right is a quad issued in 1911 by Pathe-Freres. In the bottom right is their office address on Charing Cross Rd. We have several quads issued in that time period in our database from several different production companies. AFTER the war is a different story. We have thousands of Quads documented in our archive... but not a single ONE from this time period. Documentation on poster releases between WW1 and WW2 is extremely hard to find. The paper drives and shortages during WW2 literally eliminated ALMOST all records. Many, many titles can only be seen through Trade Ads. Unfortunately trade ads don't give ANY information about the posters issued. We have found enough to know that most of the normal sizes continued through this time period. Quads, 3 sheets, 6 sheets and banners, etc. were standard issues on major titles. 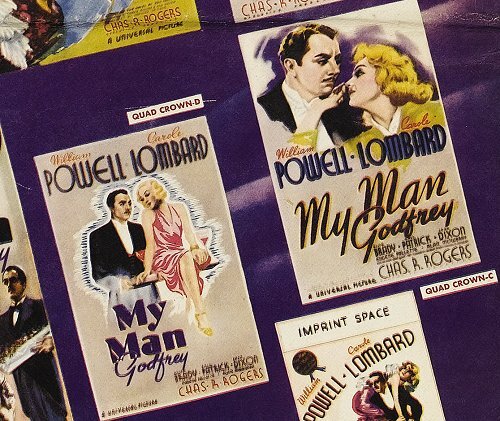 NOTICE: the clip from this 1936 pressbook for My Man Godfrey.. This shows 2 - Vertical Crown Quads being issued, plus 2 - 6 sheets (our 3 sheet), a 12 sheet (our 6 sheet) and a 48 sheet (our 24 sheet). During the advertising renaissance between 1936 and 1939 there were major changes made. For information on this see our article on Poster Development. We have several Quads in our archive starting with 1938..... and they are all horizontal. BFI is suppose to have a horizontal quad that was first tried in 1936. The new horizontal quads that appeared are called a Broadside Quad. When World War II started, the paper shortage eliminated the variety of paper issued for each title. Sometimes only a Quad and stills is all that was issued....... and sometimes the Quad was eliminated and only stills were issued. Notice: on the left is a clip from a pressbook for the 1942 release Night in New Orleans by Paramount Film. NOTICE: During and immediately after each war, larger poster sizes were not issued. Notice this announcement from the 1946 pressbook of Wizard of Oz!!! Notice in the clip above that posters couldn't be issued any larger that the 'BROADSIDE' Quad OR the 20x60 which we call a Door Panel. Both cover the same area of space which is 1200 square inches. The Quad became more popular through the 1940s to become the dominate poster used. It's unique layout helped to make it stand out from releases from other countries, and oddly enough it seemed to overshadow all the other poster sizes and almost totally eliminating them. The film industry didn't stick with the name though, the name has pretty much reverted back to the term Quad Crown in the industry. Currently the Quad and Mini Quad are the primary posters issued on each film release.